Are you proud? Are you proud of yourselves? You should be. Not everyone loves Horizon Zero Dawn (cough), but the game's earned itself a great deal of praise, not to mention incredible sales numbers. Ah, but Horizon Zero Dawn is about incredible numbers, period. Guerrilla Games broke some down to celebrate the game's first year anniversary. "While [Horizon Zero Dawn] is very much a single player game, it does use online connectivity to log certain metrics for bug tracking and analytical purposes," writes Guerrilla community manager Victor Zuylen in a post published on the PlayStation blog earlier today. "In aggregate, these metrics paint a fascinating picture of the way Aloy's story is experienced by players—from their favorite weapons to the choices they make in life-or-death situations." "The Circle of Life was kind of lame, we're going to give this 'Circle of Oblivion' thing a try for a bit." The choicest numbers are displayed on an infographic. 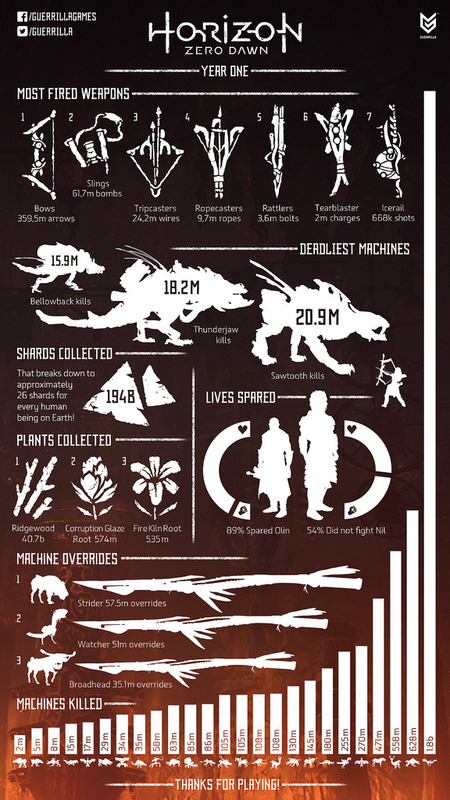 Some cool bits include "57.5 million Strider overrides," "20.9 million Sawtooths killed," and "24.2 tripwires set up." Here's the coolest stat, though: Players have killed 1.8 billion Watcher enemies. Watchers have a symbiotic relationship with bigger, deadlier machines and will scream a warning to potential prey if you creep in too close, so we'll just say the little tattlers had it coming. Horizon Zero Dawn also received an award for "Outstanding Achievement in Video Game Writing" at the Writers Guild Awards last month. I'm not saying you should be inspired to write fanfiction about a Watcher who's constantly dodging the shadow of Death, but—well, actually, that's exactly what I'm saying you should do. Tagged with Guerilla Games,	News,	PlayStation 4,	Sony Computer Entertainment.